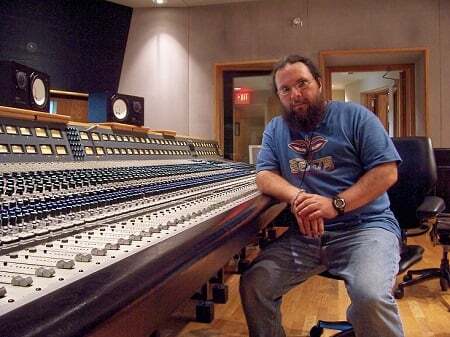 Recording Connection mentor Seva Louis Ball (Knoxville, TN) has merged his love for technology and invention every day of a career spanning more than three decades. Seva has recorded, mixed, and mastered with artists across the musical spectrum from Dolly Parton to Metallica, David Bowie to Corrosion of Conformity. He’s also been entrusted with manning the transfer of analog to digital records for the Grammy™ funded archives of David Lewiston, now housed at the Library of Congress, as well as the father of the synthesizer, Bob Moog’s personal analog tapes, housed at Cornell University. As chief engineer for Sequoyah Studios, Seva produces, records, mixes, and masters audio for media and music of all genres, including forensic audio. Other experience includes his prior work with Waves Audio (which won a Technical Grammy in 2011) since the popular plugins’ inception back in 1992. We recently connected with Seva Ball to learn more about his journey into audio and to find out what he looks for in the students he trains, and especially, the ones he decides to hire. What led you into audio in the first place? “I was always fascinated with the stuff… Both of my parents taught in college for 37 years, they were music teachers, but dad was in charge of the music department. He had a very nice Ampex tape recorder. By the time I was 10, he had showed me how to use it so that I could help record recitals that were given by the music students. And of course I was learning how to play piano, so music was part of what I was doing. And the music department had, of course, a music library with lots of records and maybe 20 places with turntables and headphones. You could sit down and listen to music for your music assignment. I had a library card for the music library and the main library. So I was very much into everything, and I started listening to records and I discovered electronic music. A lot of young people think that means electronica or EDM. And at that time, it was more like the abstract electronic music. It was academic, it was coming out of Columbia University and Princeton and Paris and London, and it was seen as a very, very new form of expression, just like abstract art was after World War II. There was just an explosion of abstract art and an explosion of very new, difficult, dissonant music, including electronic music that was recordings of samples on tapes, spliced and reversed and mixed and slowed down and so forth. And I just thought that was the neatest possible thing. So I’m sure I was one terrible kid. I’m quite sure. You’ve also taught audio in the college setting. Do you believe one-on-one mentoring is better than learning in a classroom environment? “Oh, by far. By far. It’s absolutely the best. It’s the best teaching experience I’ve ever had. It gives me the chance to individualize and to accommodate each person’s learning style and to accommodate their interest, and also I can push each of them out of their comfort zone in a different way. What skills and qualities do you want to see in the students you choose to bring on as externs? You recently hired two of your former Recording Connection students, Gabby Kilgore and Ryan Moore. Could you tell us more about that? “Gabby, she’s my first assistant engineer and I also hired Ryan…He’s a very good musician and has an interest in old tape machines. And I told him, ‘If you want to learn about this, you guys, I’ll show you.’…And Gabby has the best ears of anybody that’s come in, and Ryan has the most interest in understanding all of the technology of anybody. What’s your advice for longevity in the music industry? Alexa Cooper Lands Top Management Job & Get’s Back to her Music! Efrain Matias Goes to NAMM, Gets Going in Audio! Recording Connection grad April Edwards produces Kentucky Rapper & Climbs the Charts! Talking to RC mentor Jim Martignetti and Inspectah Deck of Wu-Tang Clan!